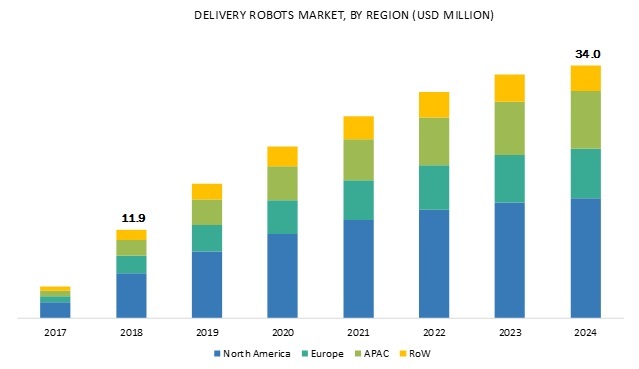 [140 Pages Report] The delivery robots market is expected to grow from USD 11.9 million in 2018 to USD 34.0 million by 2024, at a CAGR of 19.15% during the forecast period. At present, the cost for each last-mile delivery is USD 1.60 via human drivers, which could be scaled down to USD 0.06 by utilizing autonomous delivery robots; hence, the reduction in the cost of last-mile deliveries is the key factor driving the growth of the delivery robots market. The increased venture funding is another factor driving the market growth. The high rate of adoption of delivery robots with load carrying capacity of more than 50.00 kg for e-commerce applications in the retail industry is the key factor driving the market. Apart from e-commerce applications, robots with a load carrying capacity of more than 50.00 kg are mainly used to deliver groceries and heavy parcels ordered by online shoppers. However, robots under this category need to follow a comparatively large number of regulations than the robots belong to other 2 categories because delivery robots with more than 50.00 kg load carrying capacity travel on streets rather than sidewalks, thereby requiring effective traffic management. The speed limit has been the key factor for the manufacturer and the lawmaker as it proves to be vital for the safety of human commuters. However, the low speed will affect the operational efficiency, and it would result in the high cost of delivery. The speed limit allowed for a pedestrian robot is generally up to 6 kph. Technologically advanced delivery robots have made it possible to deliver different kinds of items quickly and efficiently. This factor is expected to fuel the growth of the market for delivery robots with higher than 6 kph speed during the forecast period. 4-wheeled delivery robots are expected to dominate the market in 2018 owing to their capability to well balance the robot. Reducing the distance between the front and rear set of wheels will result in better zero-radius turning in any desired direction with 4-wheeled robots. Hence, most of the robotics companies across the world offer delivery robots with 4 wheels, which are more efficient in rotating in-place. However, the market for 6-wheeled delivery robots is expected to grow at the highest CAGR during the forecast period. APAC countries such as Australia and Japan are currently involved in testing delivery robots. By the end of Q2 of 2019, these countries are expected to commercialize delivery robots developed by them. The growth of the market in APAC is likely to be propelled by the increasing awareness about the potential of delivery robots to provide delivery services with high efficiency and at a reduced cost. Apart from this, the existence of- e-commerce giants, such as Amazon, Walmart, and Alibaba, in the region provides a growth opportunity for the players in the delivery robots market in APAC. Further, with the increased demand and reduced prices of major components such as LiDAR sensors and motors, the market for delivery robots has a promising future in this region. A few major companies in the delivery robots market are Starship Technologies (US), JD.com (China), Panasonic System Solutions Asia Pacific (Singapore), Savioke (US), Nuro (US), Amazon Robotics (US), Robby Technologies (US), Boston Dynamics (US), Robomart (US), Eliport (Spain), Dispatch (US), Piaggio Fast Forward (US), Marble (US), TeleRetail (Switzerland), BoxBot (US), and Kiwi Campus (US). Apart from these, players such as House of Battery (US) and Ultralife Corporation (US) supply batteries to key autonomous robot manufacturers, and companies such as Fastree (Switzerland) and Quanergy (US) are the suppliers of light detection and ranging (LiDAR) sensors. Starship Technologies offers self-driving delivery robots that improve the local distribution of goods and groceries. The company’s vision of zero cost, zero waiting time, and the least adverse impact on the environment have redefined the local delivery chain. The company believes that robots can complete local deliveries within 5–30 minutes from a local hub or retail outlet and with 10–15 times less than the cost of current last-mile delivery alternatives. Robots are overseen by human operators, along with their property to drive autonomously, to ensure safety. The robots developed by the company have covered more than 100,000 miles in more than 100 cities of 20 countries in the world, encountering 15 million people along the way. In June 2018, the company raised the seed capital of USD 25 million, which is likely to be invested in deploying more number of robots in neighborhoods, as well as corporate and university campuses in the US and Europe. In November 2018, Nuro announced the introduction of R1, an unmanned self-driving vehicle, into the delivery robots market. Though the process has been gradual, R1 would be all ready for the final testing phase on the streets of Scottsdale. In June 2018, JD.com collaborated with Google (US) for initiating various strategic programs, including joint development of retail solutions in several regions around the world, including Southeast Asia, the US, and Europe. In April 2018, Starship Technologies partnered with Compass Group (UK) on Intuit Inc.’s (US) Mountain View campus to provide robotic delivery. With this, the company aims to expand its services and distribute thousands of robots across several campuses in the world by 2019. How big is the opportunity for AI within delivery robots? How integration of machine learning would help delivery robot OEMs to achieve complete automatization and to grasp this USD 50 billion opportunity? Which are the top use cases for delivery robots OEMs where AI can be implemented to generate revenue streams through new markets such as postal and education industries? How can onboard data computing and efficient parallel computing propel the delivery robots market to USD 50 billion opportunity by 2030? Which companies are front runners? With the rise in demand for delivery robots from various end-user industries, what are the opportunities for players now and for those planning to enter various stages of the value chain? Delivery robot manufacturers have been partnering with various food chain and e-commerce companies, how will this impact the growth rate of the delivery robots market and who will have the undue advantage? The study involved 4 major activities in estimating the current size of the delivery robots market. Exhaustive secondary research has been done to collect information about the market, the peer market, and the parent market. Validating findings, assumptions, and sizing with industry experts across the value chain through primary research has been the next step. Both top-down and bottom-up approaches have been employed to estimate the complete market size. After that, market breakdown and data triangulation methods have been used to estimate the market size of segments and subsegments. 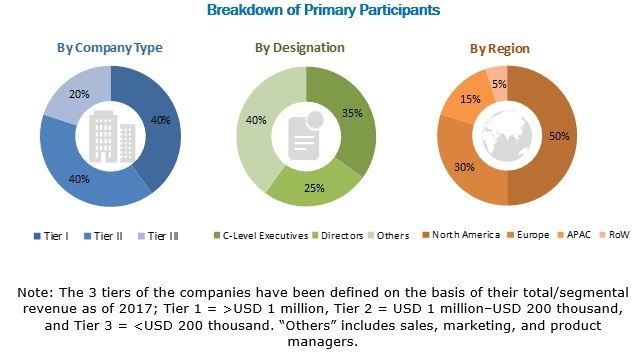 The research methodology used to estimate and forecast the delivery robots market begins with capturing data on revenues of the key vendors in the market through secondary research. This study incorporates the use of extensive secondary sources, directories, and databases such as Hoovers, Bloomberg Businessweek, Factiva, and OneSource to identify and collect information useful for the technical, market-oriented, and commercial study of the delivery robots market. Vendor offerings have also been considered to determine the market segmentation. This entire research methodology includes the study of annual and financial reports of top players, presentations, press releases, journals, paid databases, trade directories, regulatory bodies, and safety standard organizations. The delivery robots market comprises several stakeholders, such as suppliers, system integrators, suppliers of standard components, and original equipment manufacturers (OEMs) in the supply chain. The demand side of this market is characterized by the development of retail, food & beverages, healthcare, and postal industries. The supply side is characterized by advancements in delivery robots with higher load carrying capacity. Various primary sources from the supply and demand sides of the market have been interviewed to obtain qualitative and quantitative information. Following is the breakdown of primary respondents. After arriving at the overall market size using the estimation processes as explained above, the market was split into several segments and subsegments. To complete the overall market engineering process and arrive at the exact statistics of each market segment and subsegment, data triangulation and market breakdown procedures have been employed, wherever applicable. The data has been triangulated by studying various factors and trends from both demand and supply sides in retail, food & beverages, healthcare, and postal industries. Starship Technologies (US), JD.com (China), Panasonic System Solutions Asia Pacific (Singapore), Savioke (US), Nuro (US), Amazon Robotics (US), Robby Technologies (US), Boston Dynamics (US), Robomart (US), Eliport (Spain), Dispatch (US), Piaggio Fast Forward (US), Marble (US), TeleRetail (Switzerland), BoxBot (US), and Kiwi Campus (US). This report categorizes the delivery robots market based on load carrying capacity, number of wheels, component, speed limit, end-user industry, and region.